Steve as usual provided the coordinates of the transition state, and I had a good look at the 3D structure (in fact, his post brilliantly illustrates the point of providing coordinates, because playing with them may always enable new aspects to be spotted). My annotation of the transition state (labelled TS1in Steve’s post) is shown below. 8+2 transition state. Click for 3D. 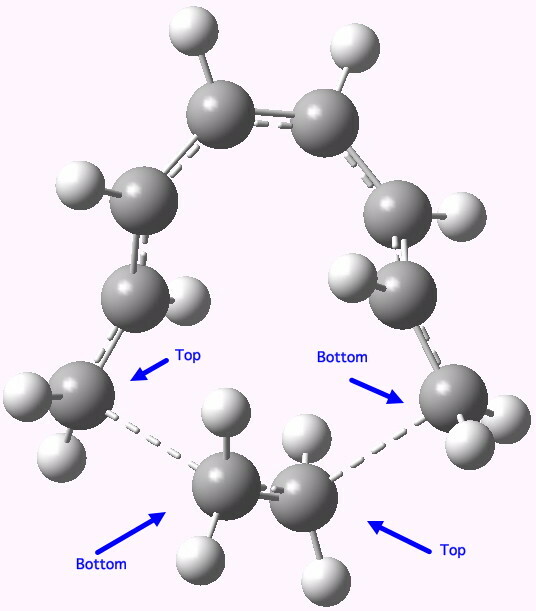 The 8π component has bonds forming on the nitrogen (and if it were pericyclic, on the ring carbon as well). If you load the 3D coordinates by clicking on the above graphic, you will see these two bonds appear to be forming from opposite faces of the 8π system. The term for this is antarafacial. 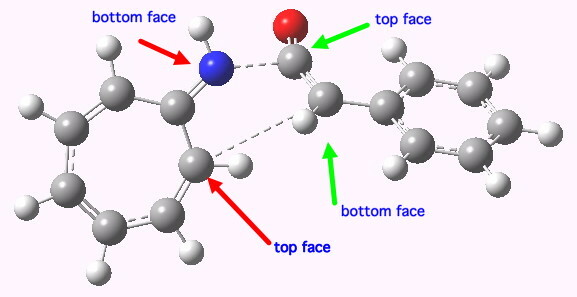 The 2π component of the ketene is also twisted, and one can observe at least a hint that the two bonds to it are also from opposite faces (for more details, see this article we published in 1993), again antarafacial. 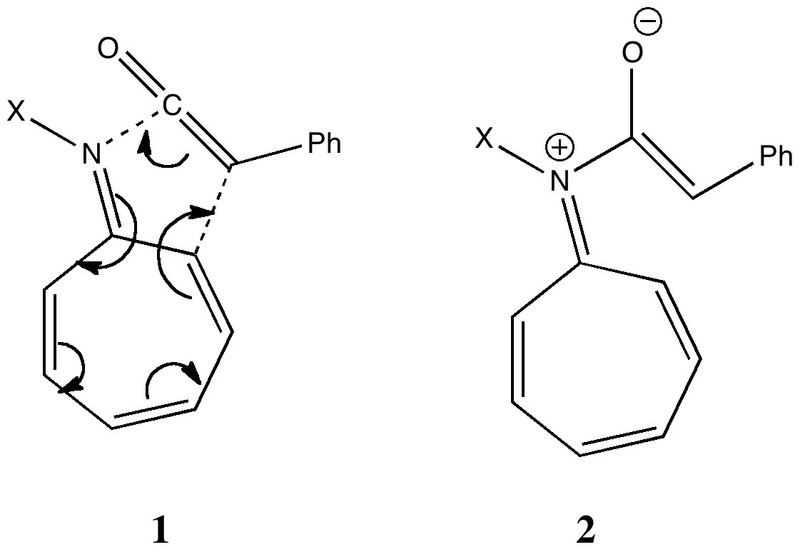 It was only in 2005 that it was recognised that a transition state with two antarafacial components would be 4n+2 aromatic (equivalent to a doubly twisted Möbius system), and it has to be said no good examples of this mode have yet to be observed experimentally. In fact, in the present example, that second bond does not go on to form in a concerted manner with the first, so the reaction is in fact stepwise and not pericyclic. But it does seems to at least initially have some features of a doubly twisted Möbius cycloaddition. The IRC (intrinsic reaction coordinate) for TS1 which reveals the stepwise nature is in fact a classic (the lhs forms the zwitterion, typically with a small reverse barrier). 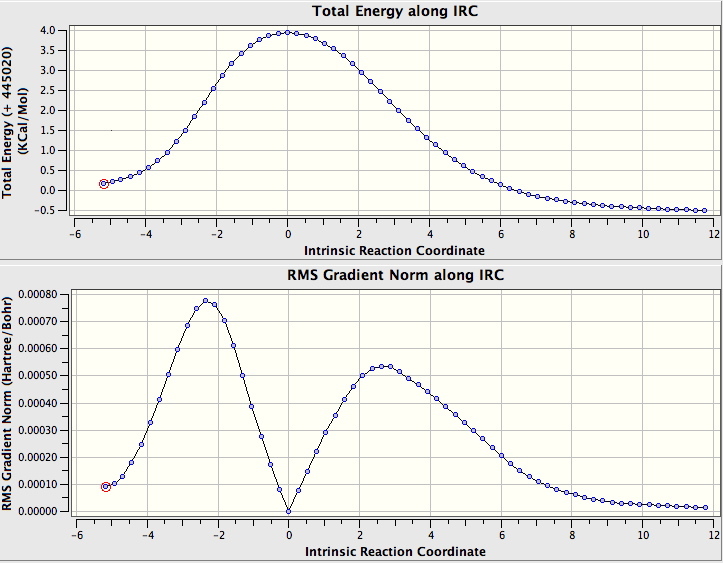 Intrinsic reaction coordinate for TS1. So on to the design. Attempt one is to remove the nucleophilic nitrogen lone pair, and the electrophilic carbonyl, thus suppressing the desire of the reaction to form a stable ionic intermediate. The cycloaddition between an octatetraene (the 8π component) and ethene (the 2π component), formally labelled as a π8a+π2a cycloaddition, looks as below. A Di-antarafacial 2+8 cycloaddition. Click for 3D. In fact, this too is not a proper concerted transition state for a pericyclic reaction, since it has a second (albeit small) imaginary mode of 84 cm-1 corresponding to desymmetrisation so that one bond forms before the other. Ethene, it seems, is not fond of cycloadding bonds antarafacially. The transition state is however aromatic, with all the ring bonds of the correct length (~1.4Å). In the interests of balance, I do have to note that a competing π8s+π2s reaction is likely to be lower in energy. The design is now to try to convert that second negative force constant to a positive one. Let us try replacing ethene with O=C=C=O, which might object less to an antarafacial mode across the central C=C bond. No luck there, the second mode is still imaginary (92i). 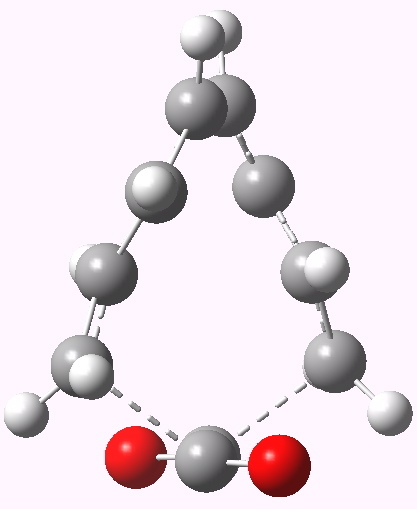 The pericyclic mode is also unusual, involving breaking the central OC-CO bond. 8+2 cycloaddition involving carbon suboxide. One more go, this time to replace ethene with cyclopropene (the double bond might be expected to be more reactive now). Still no luck (126i cm-1). In fact, a more complete exploration reveals that all these various combinations exhibit the same behaviour; π6a+π4a, π10a+π4a, π8a+π6a and the triple-twist Möbius π4a+π4a+π4a. This post attempts to show how one can take an experimental observation, couple it with some calculations, and see if anything out of the ordinary might emerge. One might then try to tweak the reaction to amplify any effects one might observe. In this case, it does seem that trying to coerce two antarafacial modes onto simple alkenes may not be possible. This entry was posted on Sunday, July 10th, 2011 at 10:17 am and is filed under Interesting chemistry. You can follow any responses to this entry through the RSS 2.0 feed. You can leave a response, or trackback from your own site. I think there’s an error in this post: carbon suboxide is C3O2, formally the anhydride of malonic acid, and not C2O2 as shown, which is the (non-existent) dimer of carbon monoxide..